Jazz is particularly fond of heroes. Often larger than life, they are both objects of praise and scrutiny, both on stage and on record. Yet, for each one of those, there are legions of workmanlike players who also deserve a place in the sun. In Montreal, for instance, saxophonist Frank Lozano qualifies as a true musician's musician. 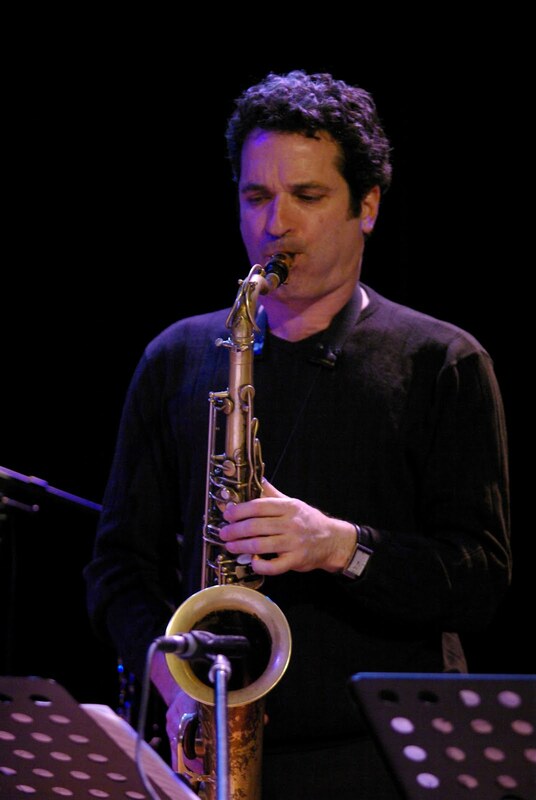 Since his arrival from Toronto some 20 years ago, this multi-instrumentalist (who plays both tenor and soprano as well as bass clarinet and flute) is one of the city's most dependable jazz journeymen. Appreciated by his colleagues, he fits like a glove in a variety of situations, ranging from standard jazz practices to more exploratory forms of music making. With his name gracing five records issued over the last couple of months, one of these casting him in the more infrequent role of band leader, 2011 seems to be a banner year for him. Taking time in his busy schedule, he sat down with this writer one morning to share some valuable insights, offering an insider's perspective on each of these productions. Marc Chénard: Last year, André Leroux (a multi-reedist just as versatile a sideman as Lozano is on the Montreal scene) admitting finding it becoming a bandleader (his 2010 release "Corpus Callosum" on Effendi marking his debut in that capacity, just shy of his 47th birthday.) This fall, you have just issued "Montreal Quartet" (on Effendi Records), which, in fact, is the second one under your own name. Like Leroux, you have spent most of your career as a sideman, thus interpreting other musics than your own. This makes me wonder if leading a band is something difficult for you to do. Frank Lozano: I guess you can use that word ('difficult'), but to me it's just a shift in function. As a sideman, you're trying to interpret someone else's musical vision as faithfully as possible, which means taking instructions, advice or cues given to you verbally by the leader. But the leader also wants me to do my thing, too, so I don't worry too much about how I play, and if I did, the leader wouldn't hire me. The difference, though, is that when you are a leader, you are not only responsible for the whole, but also you want your musicians to play as best as possible, so you want to put them in the right atmosphere, be it musically, sonically or personally, in short: to put them situation where they can play their best. More often that not, my work as a sideman helps me in my function as a leader, because I can put myself very easily in their place as sidemen. For me, it's not really: 'Wow, it's something so completely different, I'm out of my element. As you know, I already put out a record under my own name in 2007 (Colour Fields) with musicians from both Ottawa and Toronto, and that's partially why I named this new one 'Montreal Quartet' (or Mtl 4, for short). When I started this group, with François Bourassa, Adrian Vedady and Thom Gossage, people would ask me: 'Oh, is this the Toronto group?' So I said: 'No, this is the Montreal quartet' and kept saying this until I gave it the name Mtl 4. That's how I would present it when going around and getting gigs, so it kind of stuck. So I don't really feel out of my own here. As for André's own comments, I feel this as a kind of tension that is far above that of being a sideman. There's not just the added responsibility of presenting your own music, but it runs deeper than that. When you are playing someone else's compositions, you can say to yourself, at worst, maybe I didn't play that well on that tune, or it didn't turn out that well, but it's not your tune, it's someone else's baby, so that sort of comes in play here. But when it's your own thing, it is much closer to you. This is a crazy profession we have, where we bear all emotionally and say to people, 'I hope you like it'. M.C. : In this new record, there are two very short pieces that seem to relate to Italy, at least that's what it seems by their titles, they seem like variations of each other, the second one is just a duo between you and Adrian (on bass) and the first is yourself overdubbed for two saxophones, I believe. F.L. : Actually, it's three saxophones and the one with Adrian also has a little bit of percussion by Thom as well. M.C. : These are not free improvised, but have a written line to them. In fact they sound like variations of each other, even if each one has a distinct title. F.L. : You're right. These came about from a vacation to Italy with my wife. We go to a place in Umbria, a great spot in the hills known as a 'hacienda agricol turistica'. There's a big guesthouse in the middle of this olive grove and a series of small houses for rent, a really wonderful place. While hanging out there one day and listening to some music, there were swarms of birds in the trees. I just couldn't believe how melodic their songs were, so I started to transcribe these in a notebook. It is from all the snippets I could jot down as faithfully as a possible that this piece (Birds of Umbria) came about. First, I laid those sounds down on tenor with Adrian, and then added in percussion later, both Thom and a play some. From that, I proceeded to do a montage, but wasn't quite sure how to do it at first. M.C. : What is on the record, are these just excerpts of longer pieces? Because both are under the two-minute mark. F.L. : They were never conceived like beginning-to-end pieces, they are just assortments of bird sounds, but from the start I wanted to do this montage. It's like something I did in Colour Fields, I call these 'sonic sorbets', something of a cleanser between the other pieces, which really are a denser, if you will. When you have these shorter ones, they act like sorbets. For all-saxophone variation, I overdubbed the one solo tenor track twice over and pieced it together that way. This one probably sounds the most like what I heard, since there's no percussion in those hills. But my first concept was with percussion and bass, then I thought to myself after: 'What the heck, let's try this'. It worked well enough for me to include it on the record. M.C. : Apart from your own material, there are two tunes from Adrian and a collage between one of your own and one of Thom's. In this latter one, the listener might have trouble knowing where you slip from one to the other. F.L. : I'm glad to hear that. That means we achieved our goal: to make itseamless. I've been part of Thom's band since the beginning (late 1990s),and we now have a fifth recording out (see discussion of this further downin this interview), so he's influenced me a lot in the process. M.C. : You can hear that elsewhere in the recording, too, for instance, inthe second piece (Roadhouse). It sort of struck me. 'This is Thom's space'. F.L. : It's a kind of open work. M.C. : One of the things with this record is that you cannot really pin it down in one specific corner, and I think it's something you set out to do. F.L. : It is a question of doing what you do as faithfully as possible, andI happen to do a lot of very different stuff. What I've been doing overthe years happens to be converging now, so it's taking on something of itsown life, and say something of what I am about musically. It's based on tonal music stemming from the tradition, standards and what not, or from a New-York style playing, but there are elements drawn from all the different artists I work with here in Montreal, both veterans like (guitarist) Rainer Wiens, (reedist) Jean Derome (guitarist) René Lussier, (violinist) Malcolm Goldstein, as well as younger peers like (drummer) Isaiah Ceccarelli, (reedist) Philippe Lauzier and so on. So it's an amalgam of all those things. When you hear a piece on my own record, like I Said Acidity, this one is actually based on a standard (do you know which one?). It's a head I wrote, not so abstracted mind you, but still fairly well disguised, though you could find out which one when you hear the chord changes. So that's one aspect. But it goes all the way to things like the intro to Leuven Country which I basically wrote on a tone row (the title is in fact something of a bad joke on 'twelve tones'). M.C. : This second recent release is quite a different proposition than your own, since it's billed as a tribute to Bill Evans. He is known of course as a pianist who excelled in the trio setting, yet we have a quartet here. Since François is so deeply influenced by him, I'm wondering if it's his idea to get this band started, and as quartet at that. F.L. : Actually, the Bill Evans project is my idea. To make a long story short, Pierre Tanguay (drummer of this group) asked me three or four years ago to put together a trio with bassist Michel Donato for a concert at the Off festival in Rimouski, held in a church. Radio Canada was planning to record it. Now having never played with Michel, or hardly, I agreed to do it, so we played the gig, all standards by the way, and it turned out to be a lot of fun. We did more after that, but we all felt we could do more with this than that one show. I like Michel and his background, but still wanted to take it to another level. Michel loves Bill Evans, he even played with him (and Philly Joe Jones) back in 1977, so that was kind of the genesis for that. François was playing in my band at that time, and I thought he and Michel had played together before, so it could as a quartet. But to my surprise, I found out they had never played together before. I seemed like a perfect fit to me, and I was right. It clicked from the start. So we started digging into some of Evans's tunes. Take Very Early: it's kind of like Giant Steps; you've have to tackle it a few times before wrestling it down to the ground. M.C. : That has to do with the chord sequence, the melody, however, is fairly simple. F.L. : Not really. It's a very beautiful melody, yet it sort of floats across a complicated set of chord changes. Now another part of the story for me is that sax players do the music of other saxophonists (Parker, Coltrane, etc), but I thought to myself: why not have one do the music of a pianist for a change? That appealed to me and that's what lead me to put this project together. And it kind of took from there. M.C. : So you're the one who determined the repertoire? F.L. : I'm the musical director, if you wish. M.C. : Even though you're name isn't on top, it's still like your second band. M.C. : Let me put this another way: could we call it a 'coop band'? F.L. : That would be more accurate. Because we're not playing original music, I have little place to talk about how to make the music, or what I'm looking for, because we are interpreting someone else's. The leader on this gig really is Bill Evans. My job here is to bring repertoire to the table, and the guys in fact really appreciate that, because I can put myself in a way in their sideman shoes. As a sideman, you are really looking to have a strong leader, but what does that mean? He's the one who tells you: "Here's the gig. This is how much it pays. This is the time to show up. This is what to wear. This is the music we're playing, and this the time to show up for the rehearsal." Now if you show up and ask: "What do you guys want to play" and no one really knows, that's kind of freaky for a sideman, so your job as leader is to be up front on this. And since this was my idea, you have to keep that in mind, but you still have to remain question open to what your sideman have to offer as well. For instance, Michel asked me once: "Do you know Elsa?" I happened to know of it, so I checked it out. Because of that, it's in our book now, but not on the album. François did the same when he asked me if I knew Show Type Tune, and we're doing that as well. It's open in that way. One important thing I have to say on the concept of this record is that we don't just play compositions of Bill (the record is called Autour de Bill Evans, i.e. 'Around…'). It's not a tribute band in the sense of covering his tunes alone, but numbers associated to him like Nardis, Gloria's Step, and standards like Days of Wine and Roses. That opens up that range of repertoire. When we do a concert, I speak to the audience, so I do talk some about Bill's music. Actually we could really play any standard and still call it the Bill Evans band, because he played so many of them. But some are more closely associated to him than other, Days of Wine and Roses and My Romance being two good examples (the latter not being on the record). M.C. : Now Bill didn't exactly play a very large repertoire of tunes, but chose a somewhat narrower one and spent his life digging into these deeper. F.L. : Well yes, but the list is still pretty big. M.C. : But as you say, there are certain tunes that were close to him and became signatures for him. F.L. : Take Nardis. That's one that became associated to him right away. M.C. : In the first album we talked about, it's your own music whereas you only do covers in this one. The difference to me is that one is more cast in the present whereas the other comes more out of the standard 'jazz' tradition. Seen that way, I wonder if these records fulfill a different side of you? Are they like two sides of the same coin for you, where they are interrelated within a larger whole, or are they very separate things to you, as if they were like two different coins. F.L. : When I play, I just play, and the context dictates me what to play. I've always admired artists who always have their own sound in whatever stylistic idiom they happen to play in. Take a guy like Kenny Wheeler: no matter what he is playing: he could play totally free, right down the middle, in a big band, whatever, and it always sounds like Kenny Wheeler. M.C. : At the risk of making an oversimplification, I've always kind of seen two types of musicians: those into whom all kinds of music disappear, and those who sort of disappear into all kinds of music. M.C. : In view of this, do you then feel you have your own voice? F.L. : I really do, and I think I had it early on, and that's why I've kept playing. That said, you're always in the process of refining it, you constantly add things while questioning it, too. You may even strip it down and build it back up. To me the word 'voice' also brings about a 'need'. When you have that need to play, you can actually hear it in the music, no matter the instrument played. Your voice is independent of your technical or intellectual facility. It really has to do with your need as a person, as an artist, to express yourself. The proof of that is that if you listen to records or view DVDs of any kind of ethnic or traditional music, you may come across someone playing a very simply made instrument, like a one-stringed instrument or a hand drum. Yet, they are able to create so much intensity as to actually transcend the actual making of the music. For my sake, if you can't do it like that, it's not worth doing otherwise. When I talk to students about this need to play, I tell them if they don't feel that need, then they'd better get themselves a real job. Actually, I'd do that myself just to make some money and have a normal life, but in the present circumstances my life is about as normal as it could be. M.C. : This group is the one headed by Alain Bédard; he's not only the bassist here, but also the label boss. I am told it is one the oldest bands you're part of. F.L. : We go back to the mid-1990s, pre-Effendi days in fact. Pierre Tanguay was the original drummer and Yves Léveillée had the piano chair at that time. M.C. : This makes for an interesting case: given its history, I wonder whether you have certain expectations when you arrive in the studio to record with a group you've been part of for a long time? In fact, do you have expectations at all before any recording session, or do you approach a session as if it were an open slate before you? F.L. : There's a bit of both for me. Now if someone just called me up out of the blue and we did a rehearsal or two beforehand, I wouldn't have as many. But when you've been playing with a group for some time, you know the guys and the feel, so you certainly have some beforehand. The difference in this record is that all material had not been road tested beforehand, or very little at least. It turned out to be very complicated, very hard to play. M.C. : On the record, you're credited as playing saxophones, but it seems you play tenor alone, apart from the fourth track (Fleurs carnivores, a Carla Bley composition and only cover of the album) where you sort of ghost Alain's arco playing on bass clarinet. As in most of your records, you play tenor predominantly, so it must be the one you're most comfortable with. F.L. : But I love playing the soprano, and I do feel I have a good voice on it as well. I've eliminated instruments I feel I am not as at ease with, but the bass clarinet is one I still do feel I have a voice on, as difficult as it is to play. M.C. : You picked up bass clarinet only a decade or so ago, so you don't have the same proficiency on it that on the saxophone. F.L. : I've been on sax for just about all my life, while bass clarinet came in much later, I've been using it for a little over ten years now. It's not the same when you are a late starter on an instrument. M.C. : Returning to this recording, do you feel this one is much different to its predecessors, as if maybe it has brought you somewhere else? This group doesn't play that often and because of that, I wonder if you are able to perceive some kind of change or evolution in the musical concept. F.L. : Sure I do. I'll come back to what I said before, about playing original music: on the one hand, you're trying to interpret someone else's vision yet, on the other, you still want to keep your own sound, so one need not exclude the other. Because the music here was more complicated, with more unusual and unconventional arrangements, you're imposing new challenges on the players every time you do that. On certain cuts, it might produce by virtue of certain limitations a kind of sound you might not necessarily have imagined, but that's not a bad thing at all when it comes out differently to what you expect. M.C. : Did you have to do many takes of the pieces? F.L: That depends on the tune. The toughest one was probable the second cut Casse-pattes. A real crazy tune with odd meters and where the one (i.e. the downbeat) is not often marked. My tune (The Loneliest Month, the album closer), we did twice, likewise for Vieux pneu (the eighth cut). M.C. : There's a problem when too many takes are done. M.C. : Unlike the previous discs, you appear only on one tune, Billy Strayhorn's U.M.M.G. (a.k.a. Upper Manhattan Medical Group). Did you know that piece beforehand? F.L. : I knew of it, it was sort of roaming in my head, but had to learn it. Then Josh told me we were going to play it in seven, so I needed to get that together. M.C. : In the studio, did you have the music in front of you or you had assimilated it by then? F.L. : For me, I try to learn pieces by heart, especially when it comes to standards, like those for the Bill Evans recording. Memorizing them is eliminating a barrier. Mind you, I would have loved to be able to do that that with Alain's music, but it's pretty hard and complicated. On my record, I think I read two things, maybe three, both of Adrian's pieces and Roadhouse. There's one thing I'd like to add about my Montreal quartet, and which makes me very happy and that is we recorded it the right way. Nowadays, you make a demo to get a grant to record then use it to get some gigs, and when you go out and perform and get it to where you want, that's when you say: 'Yeah, now is when I'd really want to record this!' In this case, I first put the band together, then played gigs with it for a year and a half, then went in to get it recorded. So what you hear on this album is then end of a process, where the tunes have evolved, and I'm very happy about that. On a personal basis, I can say I could have played better here or there, but to me it sounds fresh and alive. F.L. : His album is basically a trio record, with two exceptions the one tune with me and another one with guitarist Carlos Jimenez. I was on his previous album, a sextet (Time and Time Again), so I was already familiar with his music, and we've played off and on over the years. M.C. : To do it that way, did he give you a specific arrangement or written out in that time signature? F.L. : We talked it over on the phone first. In fact he sang it to me. M.C. : As it is in four-four time, that means certain values were stretched out. M.C. : Was it done in a single take? F.L. : We did it in three. The first was scrapped, but the other two were good, so he made the final pick. M.C. : Did you work on it before going into the studio? Or maybe you just agreed on what to do by talking about and doing it there in the studio? F.L. : Actually we did on a session together, but with different musicians. I asked to do it, just to check it out a bit beforehand, so that's what did, briefly and on a single occasion. M.C. : Like Alain's group, you have a long history with this band as well; you're even a charter member. Your first performances go back to 1998, two years before the first record. Here we are 11 years down the road, and five records later. Having listened to it on more than one occasion, you (as a band, I mean) seem to have taken the concept a couple of steps further. The way the music is assembled is by no means obvious, so no and true and tried formulas here, so this makes me wonder whether the long group history was an asset for all of you to shape the music on this disc. Or did it necessitate some time and effort to get a handle on it, or understanding what Thom's vision or approach is? F.L. : Well, let me think about this. M.C. : Let me put it this way: there are sessions where things sort of fall into place by themselves while others are more of a struggle to get there, so I'm wondering how this one was for you? M.C. : As if he wants to pull something out of you. F.L. : Yeah. He's challenging us in a kind of altruistic way. But as I said, it's not easy, because there's something deep to it. So it's hard to do, but when you get through it, it will have transformed you somewhat. I can say this without a doubt. There are other musicians without whom I would not be same had I not played with them, and another one I can think of is Rainer Wiens. Thom is on that list as well, and that's why I hired him in my band. M.C. : You could hear him in that space you're trying to define for yourself as a leader. F.L. : Absolutely. He's an artist and a musician first, who happens to play the drums, and very well at that. He plays 'jazz-jazz', too, but has chosen to go down the less well trodden path. As for the album, he told us he had new stuff for it, and we hadn't played for a while, the previous thing was our 2010 concert with Drew Gress (subbing for regular bassist Miles Perkin). So we started rehearsing it first, and it was pretty tough. We worked on it in three, maybe four sessions, but the recording went down in a single day. That was a killer; by the end of it we were just wiped out. M.C. : I can imagine, because of the demands of the music, especially from a conceptual point of view. F.L. : For all of the apparent openness of the music on the record, this album is more about limitations and oppositions. There are sections, for instance, that might appear completely open, when we're actually working on a very specific idea of group architecture. The voices may be independent, but it's what one is trying to do in relationship to another in his solo. Now once you are inside the bubble, the limitations are so interesting, yet they are very expansive at the same time. It's kind of paradoxical but these limitations give depth to the music and make it sound more wide open at the same time; that's what is so amazing about it. There are cases when you can do anything you want musically, but it can suffer from a lack of focus, or have some intention to it. Once there is focus, then it becomes really intense. M.C. : When I hear a recording like this, it's clear to me that only a band that has been together for some time is able to make music like this. You just cannot have a pick up band do this. F.L. : That answers the question you asked, about how hard it was to work on it, or whether you just come in and rely on what you know. What we do is rely on all of the common experiences we have lived together over time. Interview taken in Montreal on October 24, 2011 by Marc Chénard.